No We try to accomodate every event, big and small. Yes We currently work with clients across Australia and New Zealand and would love to meet more internationally! Depending on the complexity of the project, as well as our schedule, some suites can be turned around in as little as 10 days. Usually however, it is best to allow 4-6 weeks form start to finish, for a custom designed suite. 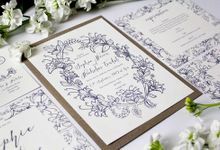 My advice is that you can never be too early or organised, especially when it comes to custom designing! At With Paloma, we only are happy when perfection is achieved and sometimes that means we need at least a month's lead time. 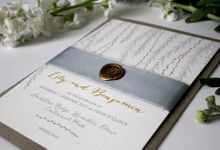 In a world where the word ‘wedding’ means an automatic price inflation, at With Paloma we endeavour to create the highest quality invitations at a very achievable, affordable price, without any sacrifices. 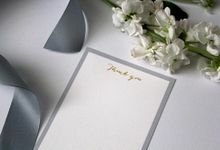 When you choose With Paloma for your stationery needs, you are going to work with someone who never accepts anything less than perfect for your project and will always be there to answer any questions or concerns along the way. With Paloma was a dream that evolved whilst on holiday at Paloma Beach in Saint Jean Cap Ferrat, France. So when I finally was able to create the business in 2016, it seemed only right to acknowledge its beginnings. 50% deposit due before design commences. Remainder due before production commences. 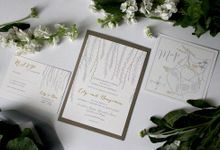 With Paloma is a studio based in Sydney that produces bespoke and ready-made stationery for weddings. 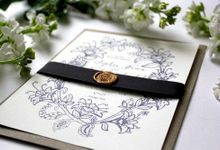 Head designer Jade loves working with her clients to tailor-make beautiful stationery that they will forever cherish as the first announcement of their most special day. “It is my strong belief that great design doesn’t have to come at a price. 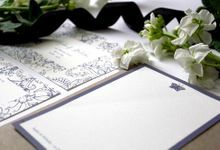 I aim to create timeless, high-quality stationery, without breaking the budget. The end result is not only beautiful, but something to be proud of."